The month of July is ending and soon we will be back on Big Smile. Our anticipated departure from Solomons MD for parts north is delayed about a week due to the delay in shipping of the cabinets from China to the east coast. Washburn’s Boatyard did email some pics today of the newly arrived cabinets and they look beautiful. Can’t wait to see them installed. 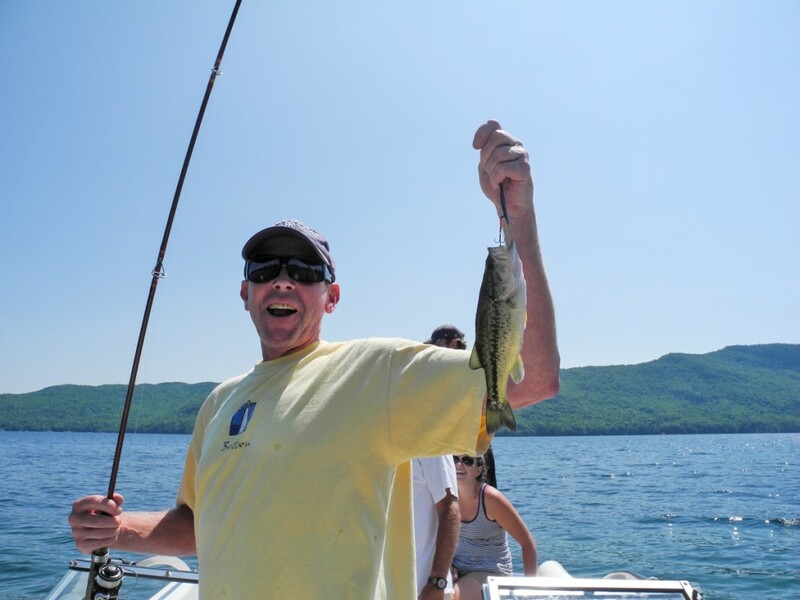 The lake has been superb with gorgeous, dry weather and temps averaging in the 80’s. 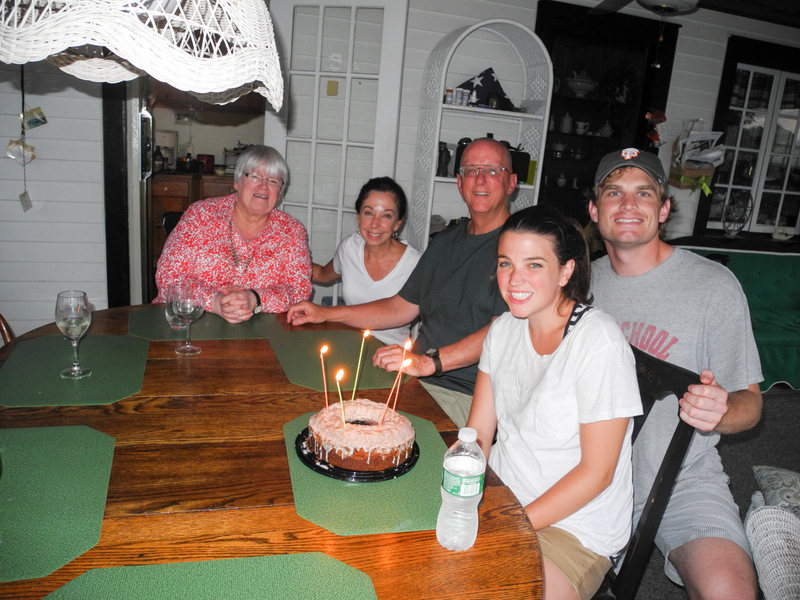 We have had a number of guests including an aunt and uncle, a cousin who had not been here in 22 years and both our kids. We also had the pleasure of helping launch our neighbors sailboat and our friends sailboat all on the same, glorious day. The six of us had not been together since last summer. 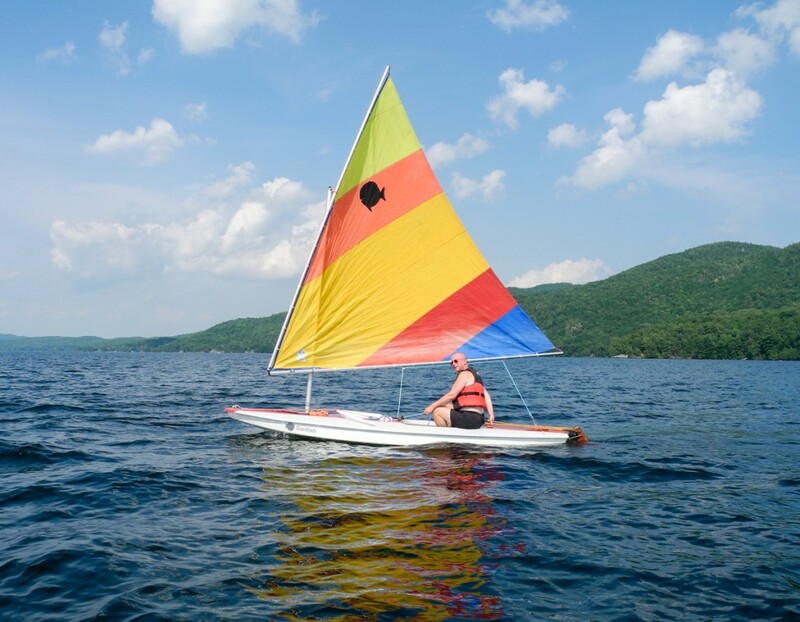 Our sunfish got a lot of use in July. It may be small but it’s big on fun. 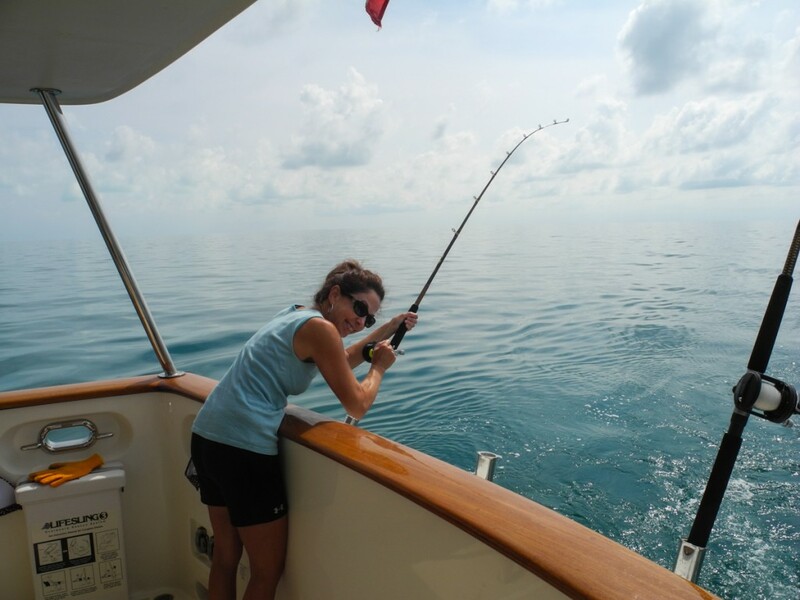 We also had lots of fun fishing. It is not the same as saltwater fishing from Big Smile but Tara’s boyfriend did catch a 27″ lake trout which we cooked up. 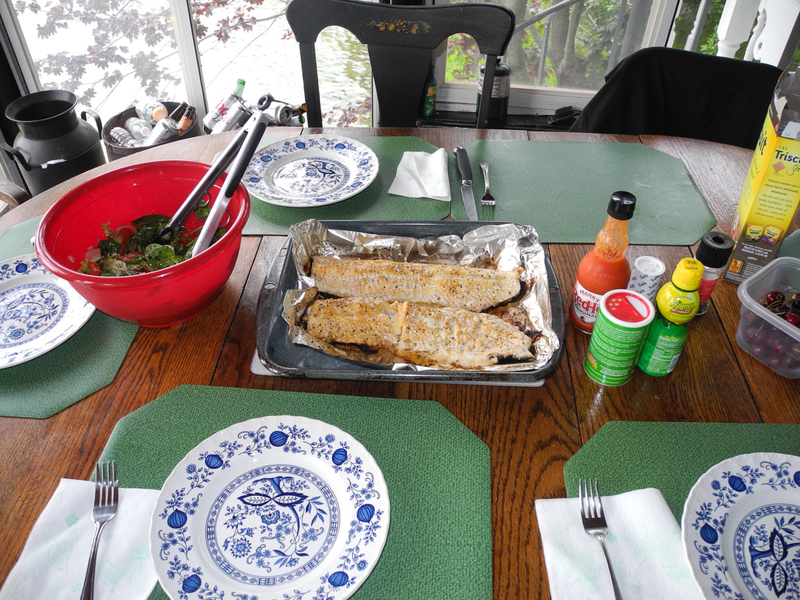 The taste of lake trout paled in comparison to the Black Fin Tuna and Cero we caught in the Bahamas. 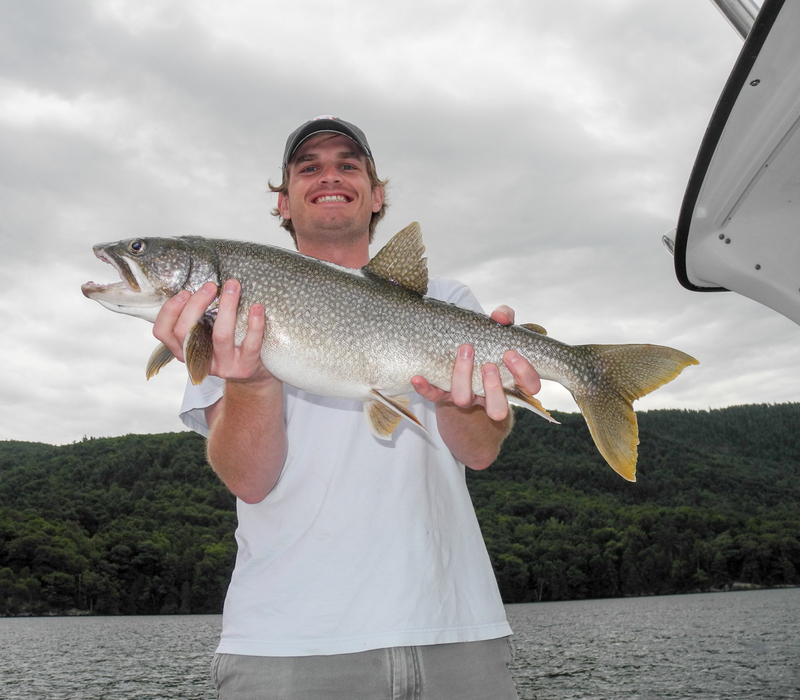 Many smaller, uneditable versions jumped on the hooks but even an unsuccessful day on the lake is better than “a day at work”. 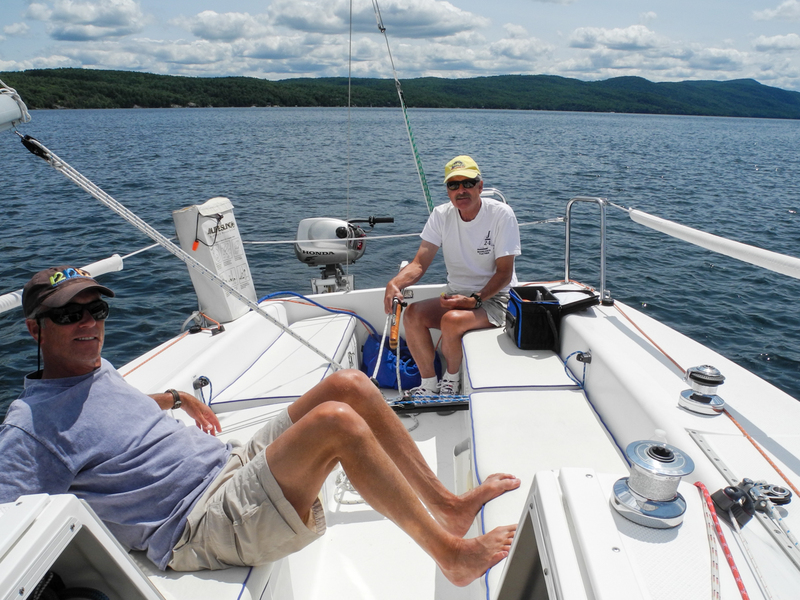 Our friend John came over for a last minute sail to end the month of July. 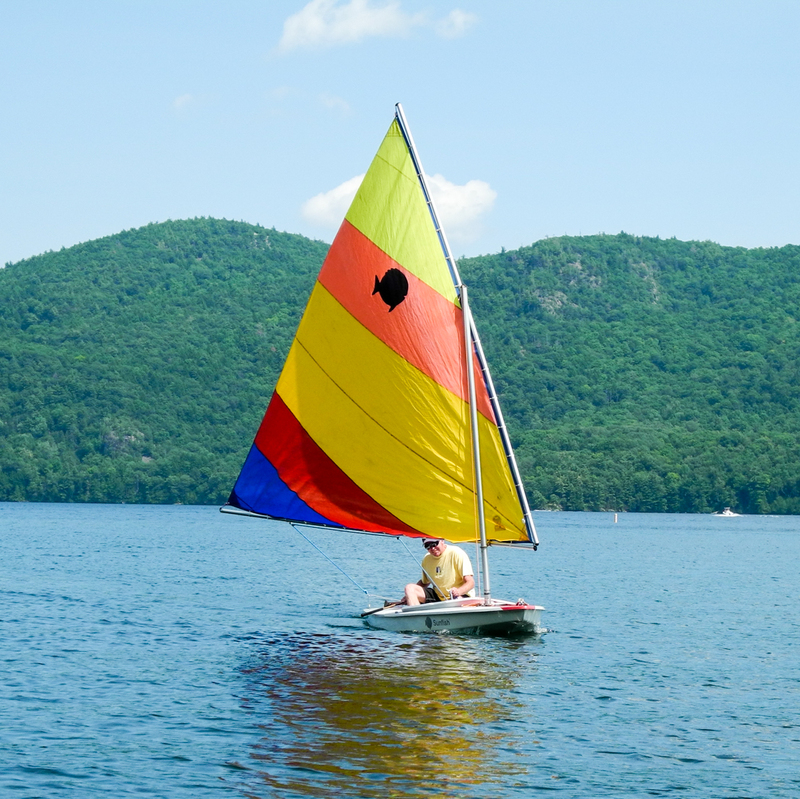 A very unusual sail we had as the wind was from the west which carried us all the way to Anthony’s Nose, a prominent feature on Lake George. Back to Vermont for several days then down to Washburn’s to pick up Big Smile. We are hoping this years hurricane season remains as serene and problem free as last years. 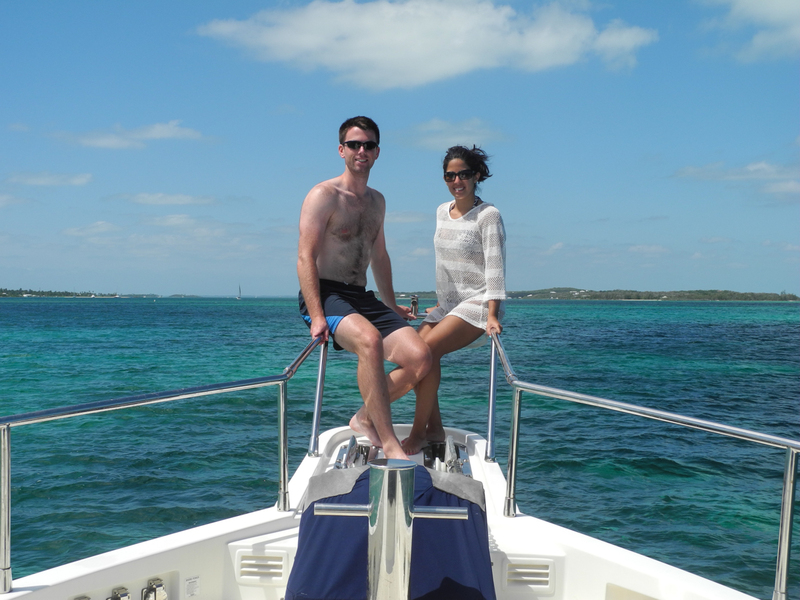 Friday morning we dropped Andrew and Nicole at the Great Guana Ferry dock. Albury’s Ferry runs regularly scheduled service to Marsh Harbor. From there a quick taxi to the airport and back home in a few hours. Our trip would take much longer. 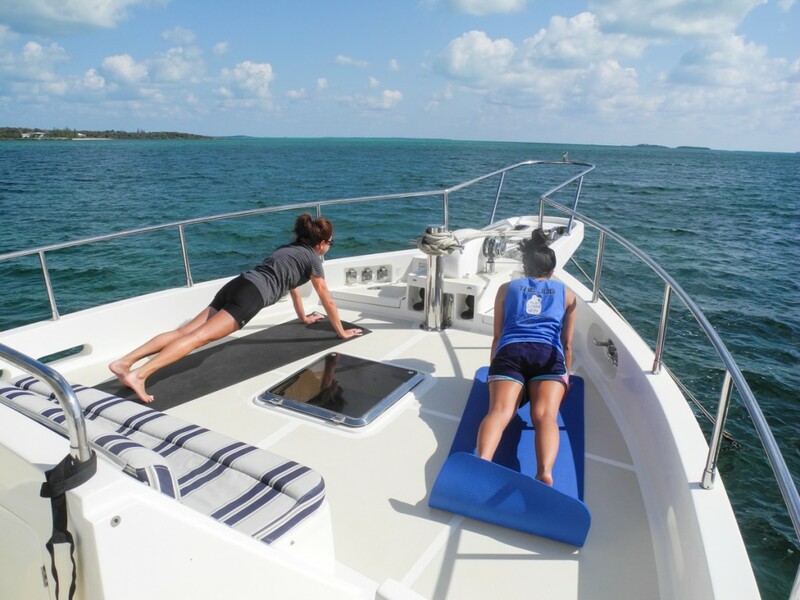 The plan was to head thru the “Whale” to Green Turtle Cay where we would spend a night at the Bluff House Beach Resort and Marina. Weather was perfect and no Atlantic swells kept us from transiting the whale. 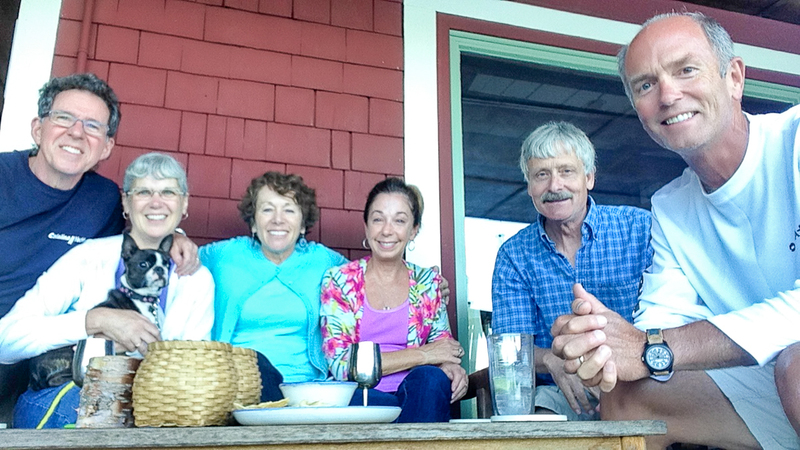 Three hours after leaving Great Guana we were at the Bluff House dock. 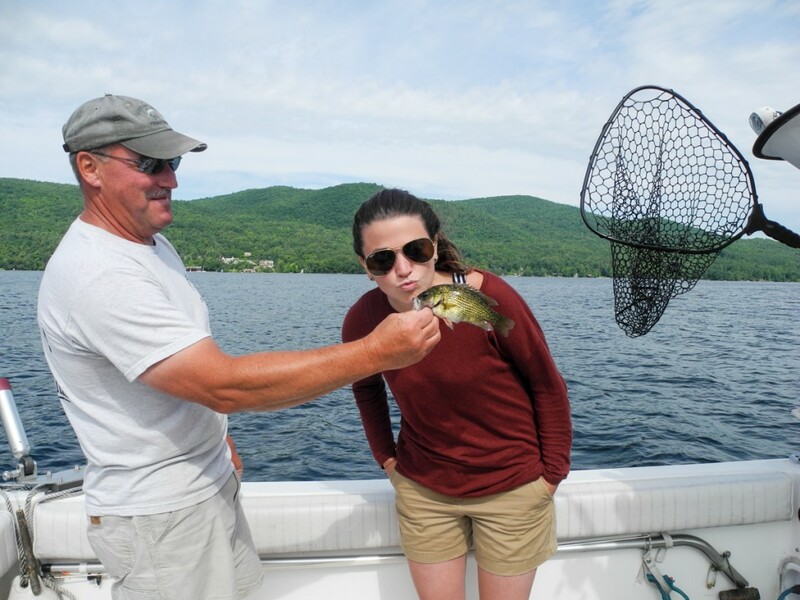 As it was Memorial Weekend a Big Bill fishing tournament was taking place. 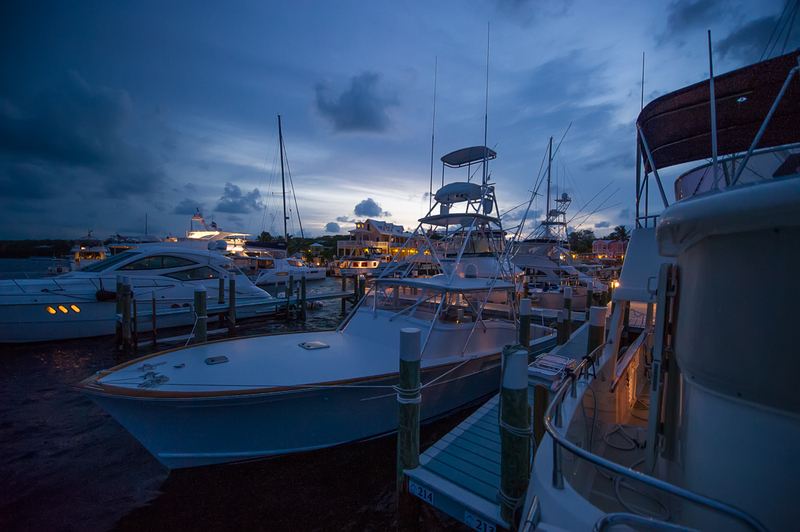 Between Bluff House and Green Turtle Club we counted over 25 fishing boats that night. Bluff House has a small but nice beach with a beach side bar. 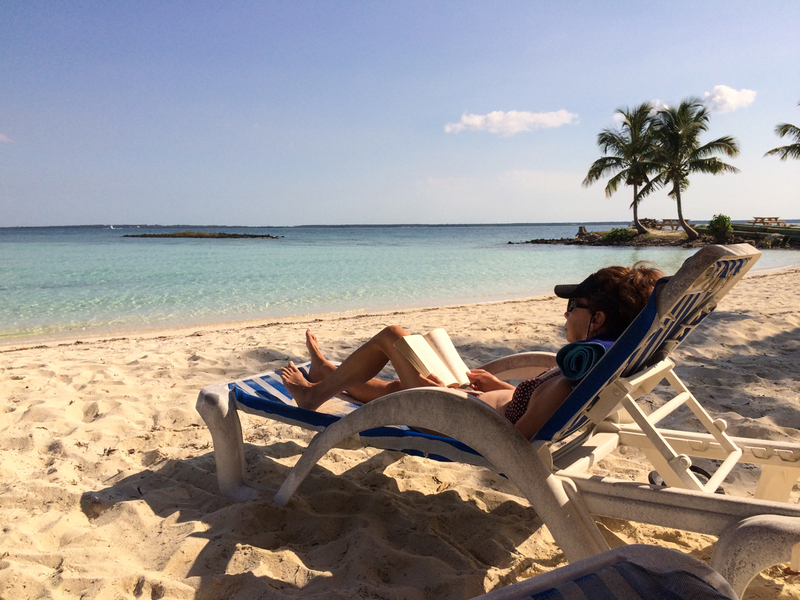 We spent the remainder of the afternoon sitting in lounge chairs. After breakfast we headed out for the 8 hour run over to Great Sale. The weather was good and so was the fishing. 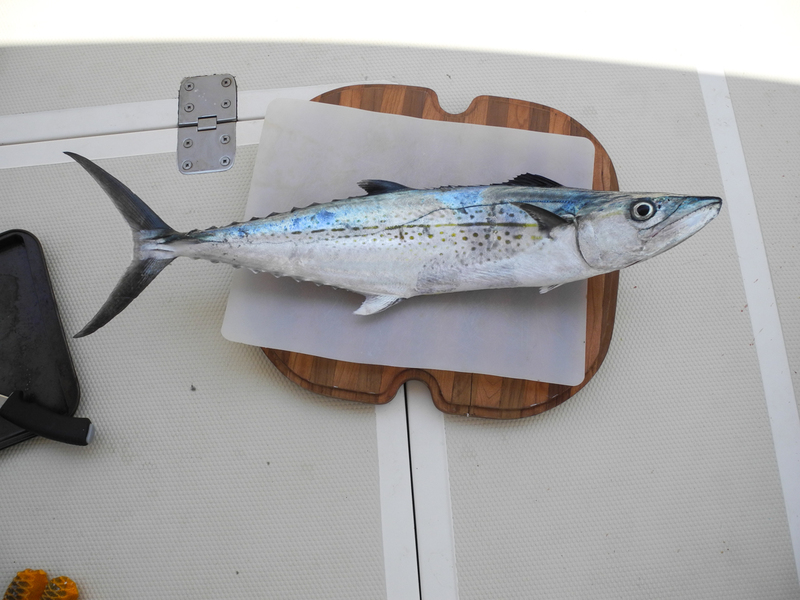 We alternated between catching Cero which we kept and Barracuda which we cursed. This last leg was to be our longest yet. Great Sale Cay to Charleston SC was a 385 mile run. 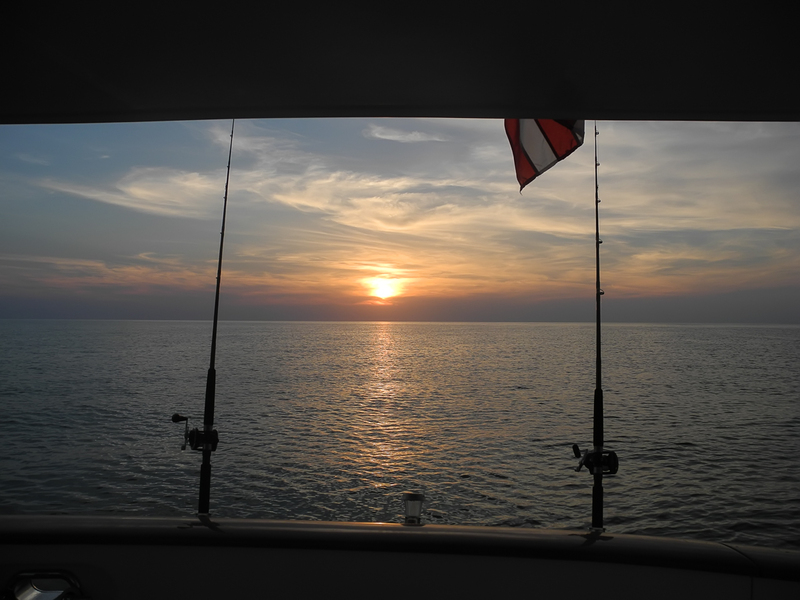 The multi day forecast called for light winds and small, short period seas. The first 65 miles are on the Little Bahama Bank where water depths are consistently 12-20 feet. With auto pilot steering we spent the day looking for sharks and other sea creatures in the crystal clear water. It is easy to know when you have left the bank. In the span of two miles you go from depths of 30 feet to well over 1,000 feet deep. Color changes are quick and fishing, at least for us came to a quick stop. We caught only one immediately after leaving the bank but it turned out to be the largest Cero we caught the entire trip. It is approximately 320 miles from the exit point of Little Bahama Bank to the Charleston SC Harbor entrance. It is also a straight line with a compass heading of almost due north. 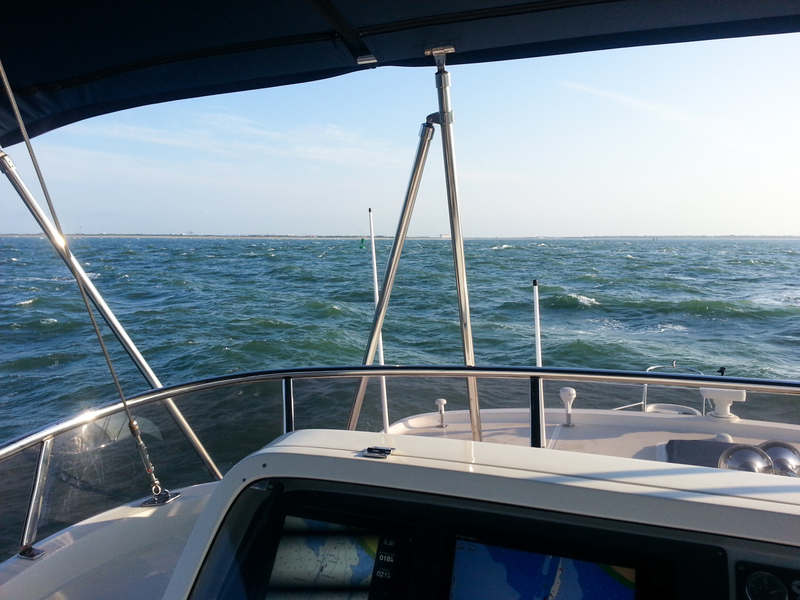 After leaving the bank, wind and seas remained flat for hours. Around 4:30 PM our radar began to pick up thunderstorms building to the west. We could see the sky darken and while pelting rain is annoying it is lightning that always concerns us. It never rained but what we saw at about 5:15 two miles off our bow was something we had never witnessed. Dropping out of a cloud was a large waterspout. 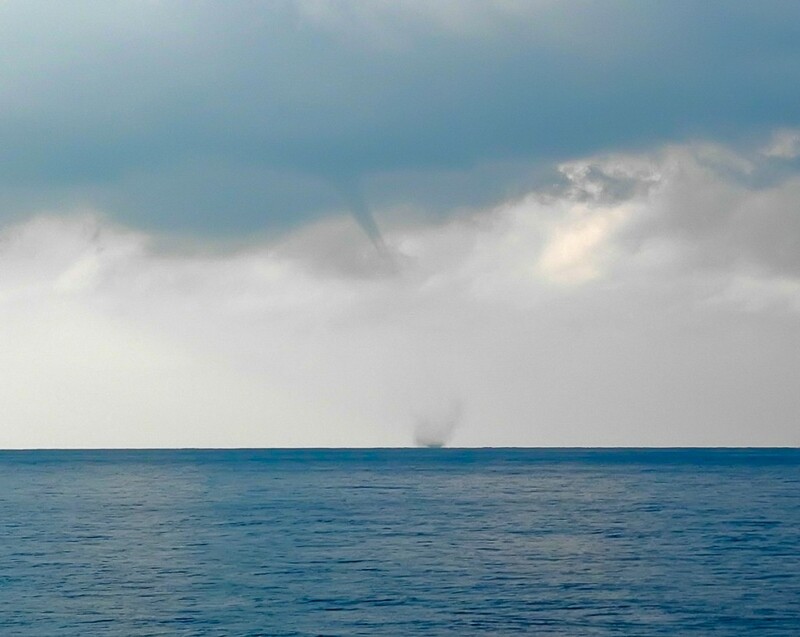 NOAA identifies two types of waterspouts, tornadic and fair weather. We were ignorant of the distinction at the time and all we thought about was the strength of a tornado. Since our radar showed the line of storms moving to the northeast we altered course to the west and proceeded to put away anything loose and check all our tie downs. By time we were done the waterspout had disappeared. Getting back on our heading we got a camera and waited. At 5:30 another one appeared two miles or so off our bow and heading slowly towards us. This one we were able to get a picture of as we altered course to port. The waterspout only lasted a few minutes but it was intimidating. The line of thunderstorms continued for a couple of hours but we did not see another waterspout. Unfortunately the storms wreaked havoc with the seas and the rest of our trip would be much less pleasant. Seas built out of the northeast and as we approached the Gulf Stream the collision of the two elements kept our stabilizers working overtime. This was a 51 hour trip requiring two overnites. It is very difficult to adjust your biological clock to the watch system you have set up. One night is easy. By the second night my midnight to dawn shift was tough. It was made tougher by the fact that we were approaching Charleston SC shipping lanes. 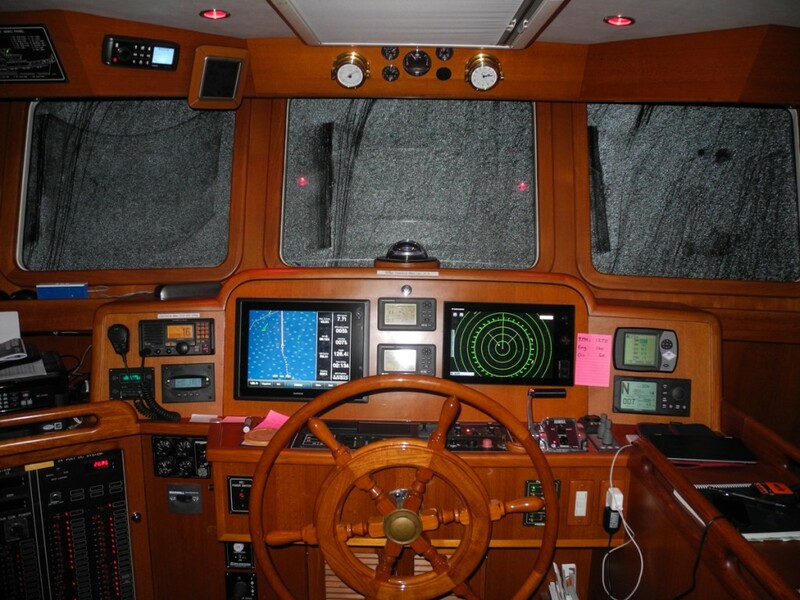 At 2 AM radar and AIS showed several ships within twelve miles all heading in different directions. 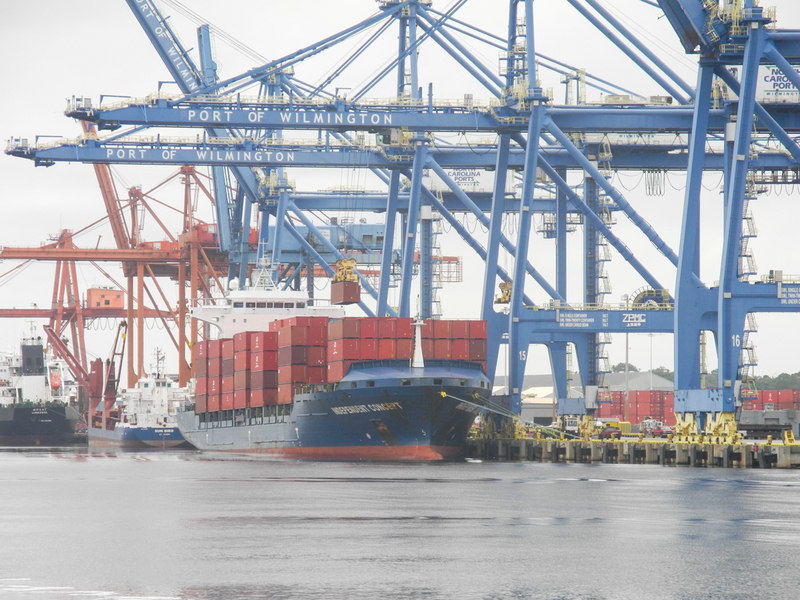 The Port of Charleston is big, ranking 8th in the US in dollar value of goods handled. The entrance during the day is straight forward although you do pass container ships at very close range. 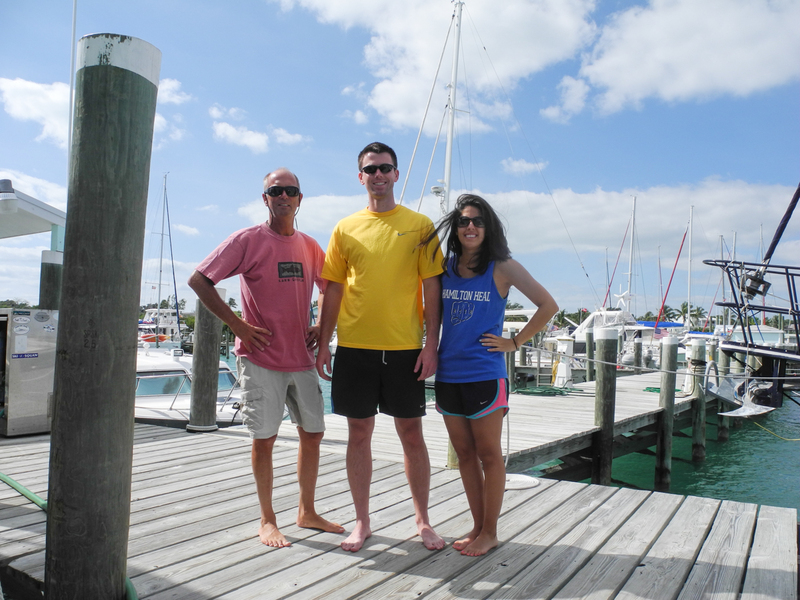 At 9:30 AM we pulled into Charleston Harbor Marina, 51 hours after leaving Great Sale Cay. Our friends on Silver Heels would arrive the next day having left the Bahamas 70 miles east of our jumping off point. Two days later we left Charleston for Wilmington NC. We arrived at the mouth of the Cape Fear River at 2 AM and had to drop the hook right off the channel for a few hours sleep before continuing up the River to Wilmington. Big Smile docked in Wilmington for about two weeks while we headed north by car. On June 17th I flew down to pick her up. 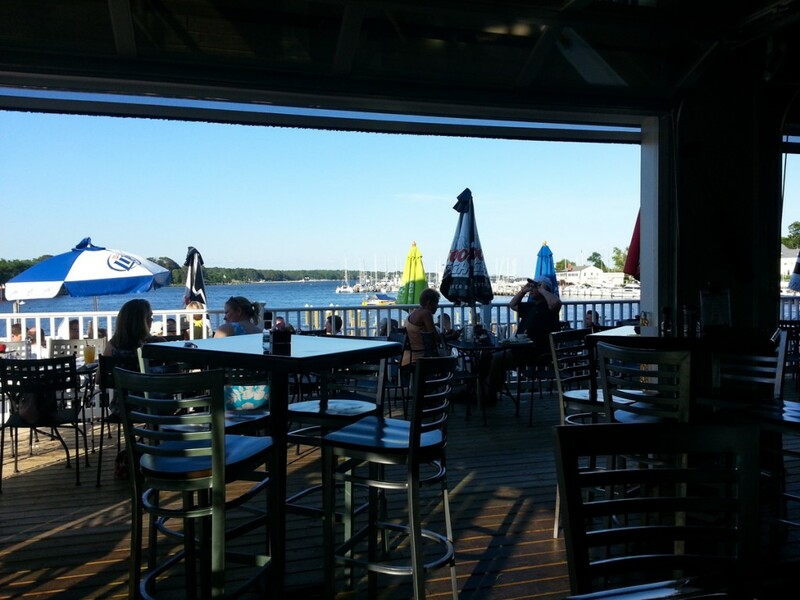 I left Wilmington the next day and six days later we were docked at Washburn’s Boat Yard in Solomons, Maryland. It was my first long distance single-handed cruise and all went smoothly. 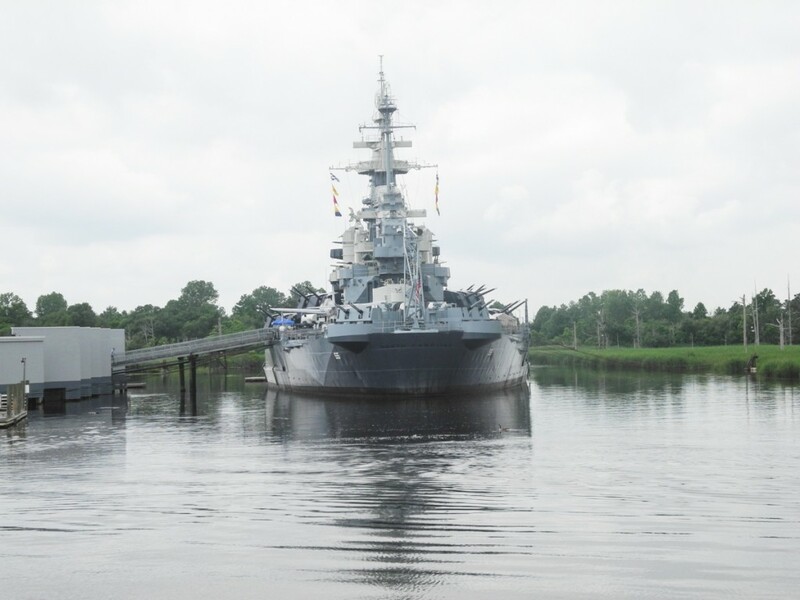 Big Smile will spend the month of July at Washburn’s getting some upgrades and maintenance work completed. We will rotate between Vermont and Lake George. If all goes according to plan we will leave Solomons by August 1st and head to Martha’s Vineyard and beyond. 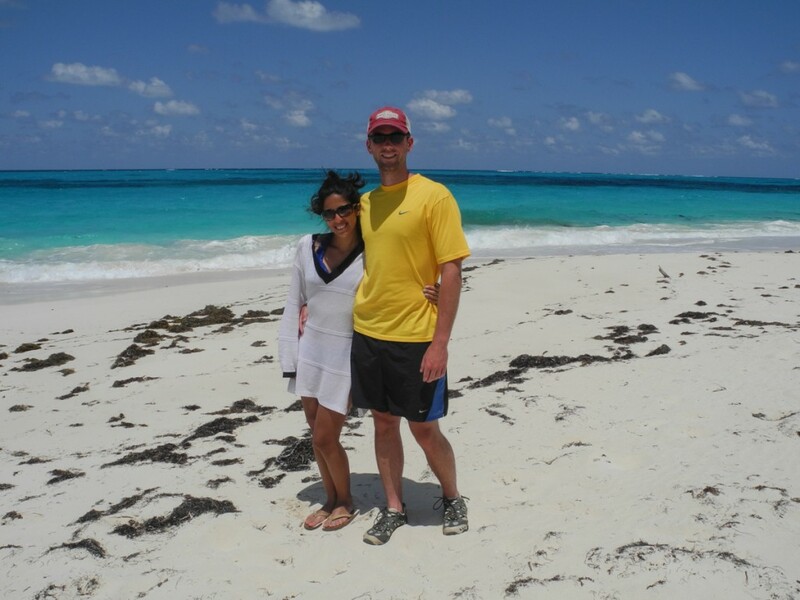 Since we had been to the Abacos the prior two springs this years trip would be shorter. We were, however, able to get to some different anchorages having come from Spanish Wells to the south not from the US east coast. Lynyard Cay would be our first stop. Our friends Jim and Beth arrived an hour later and dropped their hook. 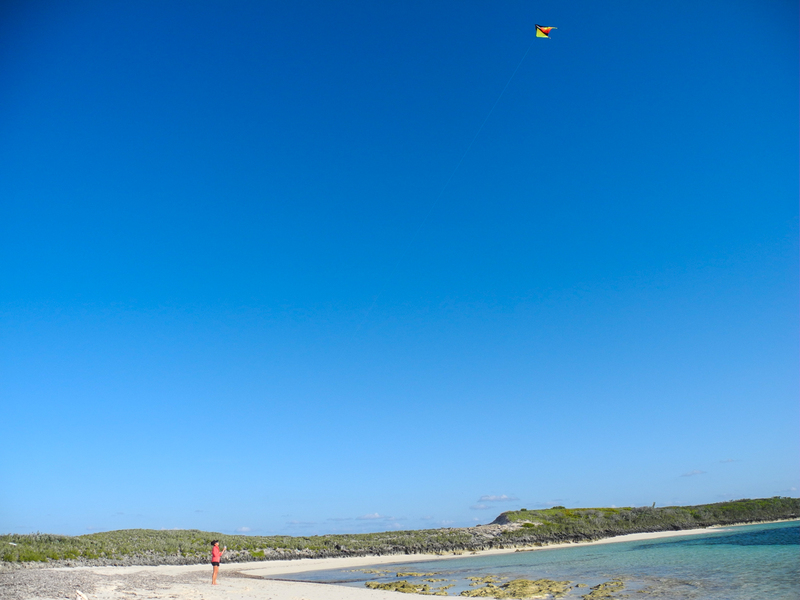 Lynyard Cay is a small island but it provides good protection from the Atlantic swells and is a dinghy ride from the well known Pete’s Pub in Little Harbor. The next day the four of us dinghy’d over to Petes for drinks and dinner. 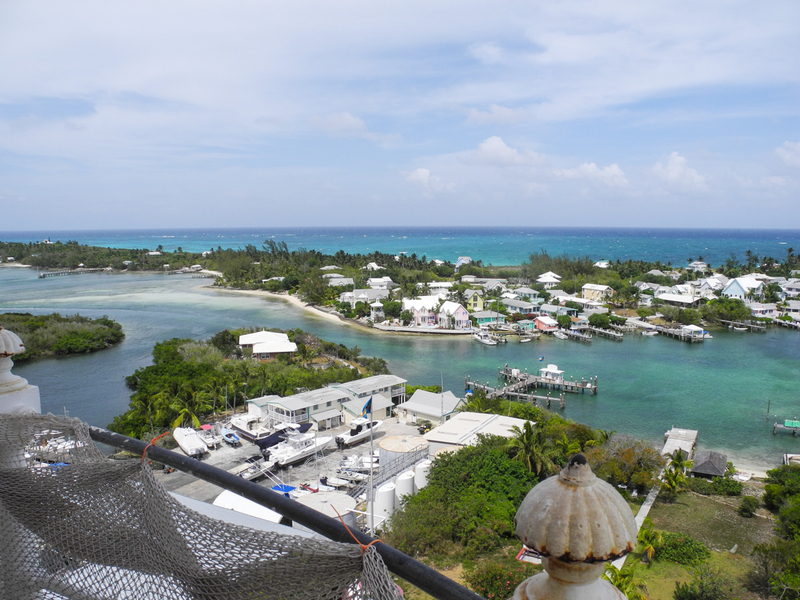 As funky a place as you will find in the Bahamas Petes also serves good fresh seafood. 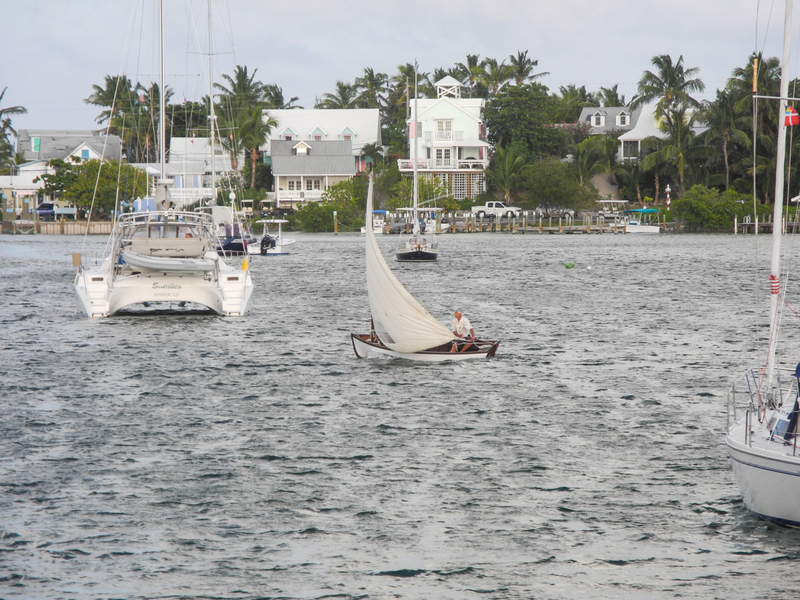 A couple of miles to the west of Lynyard Cay is a bay that goes by the name of “Bight of Old Robinson”. 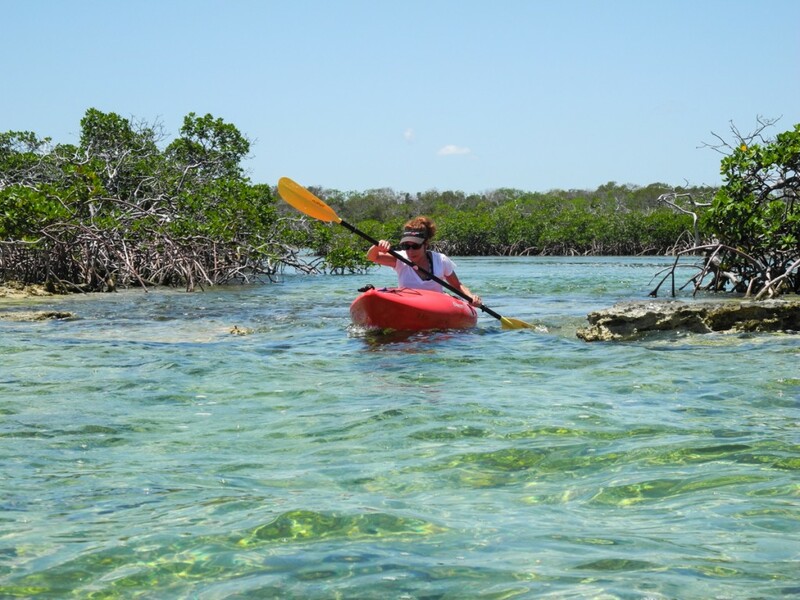 We had read that there was awesome kayaking thru mangrove swamps, blue holes and the bay itself was filled with what one trawler owner described as “turbo turtles”. 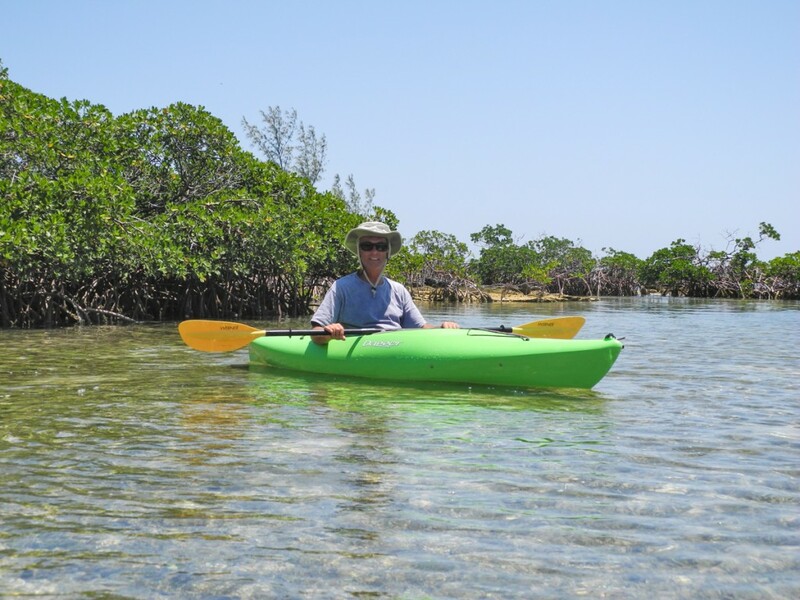 After towing the kayaks over with our dink we found the mangroves. We also found the turbo turtles. These dark shapes zipped thru the shallow water at breakneck (for a turtle) speed. We could only get within about five yards before they would dart away in a zigzag fashion. There were scores of them. The mangroves were fascinating and one could get lost if not careful. We never did find a blue hole but three divers died several years ago after getting lost in the blue hole. 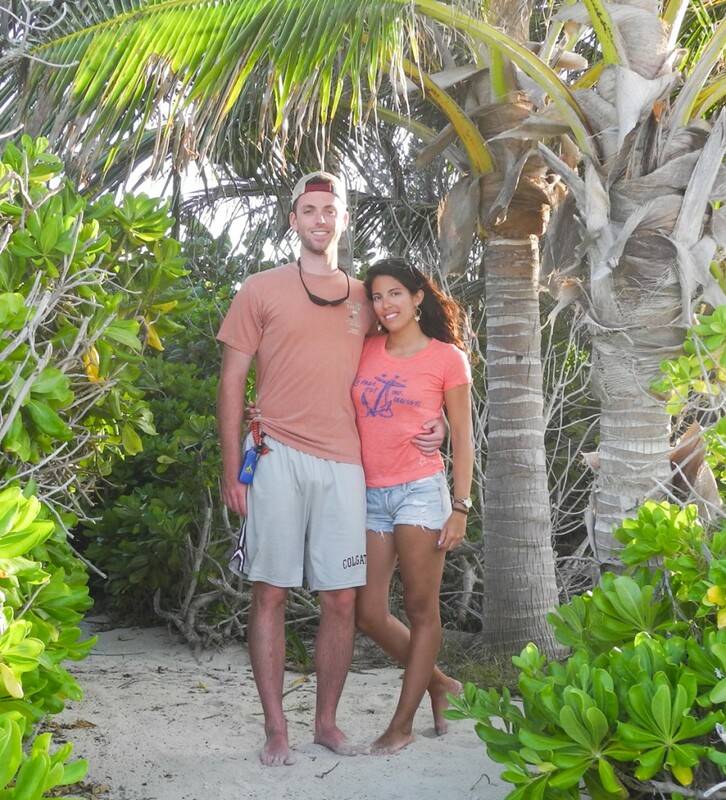 Our son Andrew and his girlfriend Nicole were joining us in Marsh Harbor. 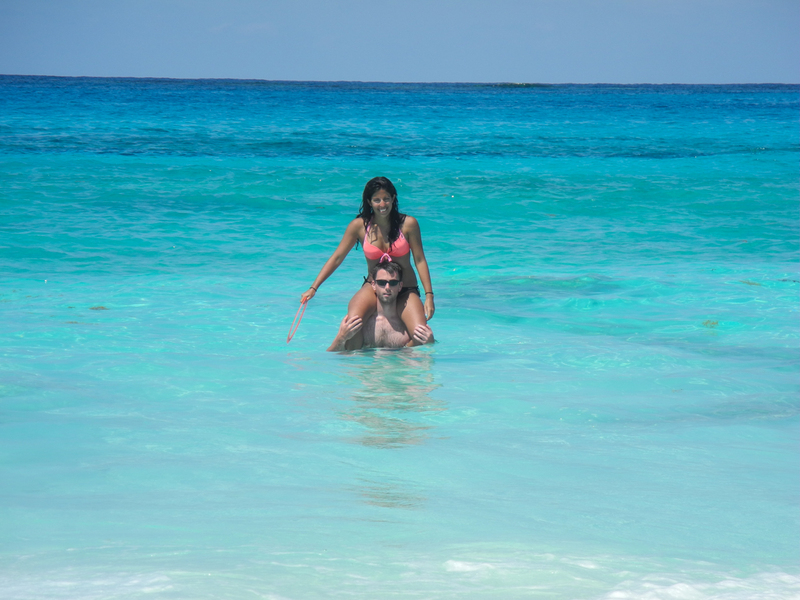 This was the main reason for cruising back thru the Abacos on the way to the states. 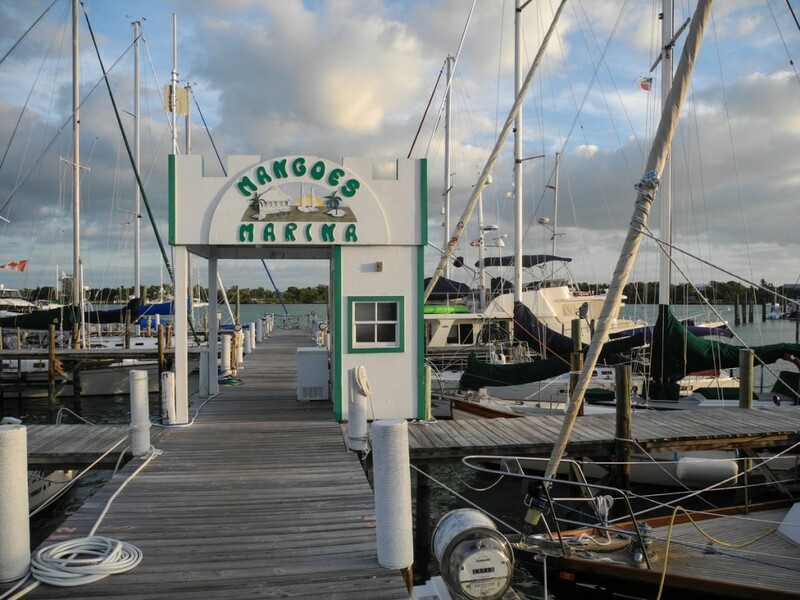 After Lynyard Cay we had a couple of days to relax prior to their arrival and chose one of our favorite harbors to try out a newly refurbished marina. 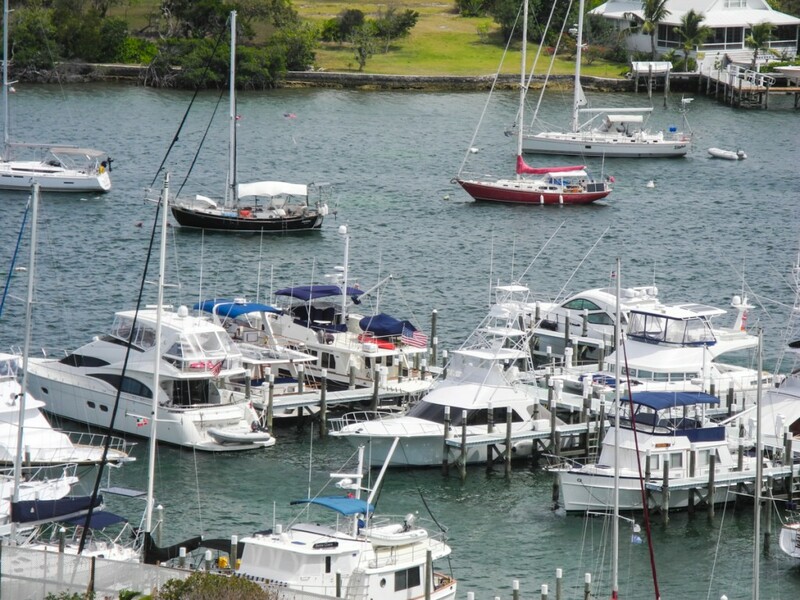 Hope Town on Elbow Cay has a small, well protected harbor with moorings and a recently updated facility, Hope Town Inn & Marina. We booked two nights but stayed four and would eventually return with Andrew and Nicole. It is a beautiful, first class facility. Probably the nicest we have ever stayed at. 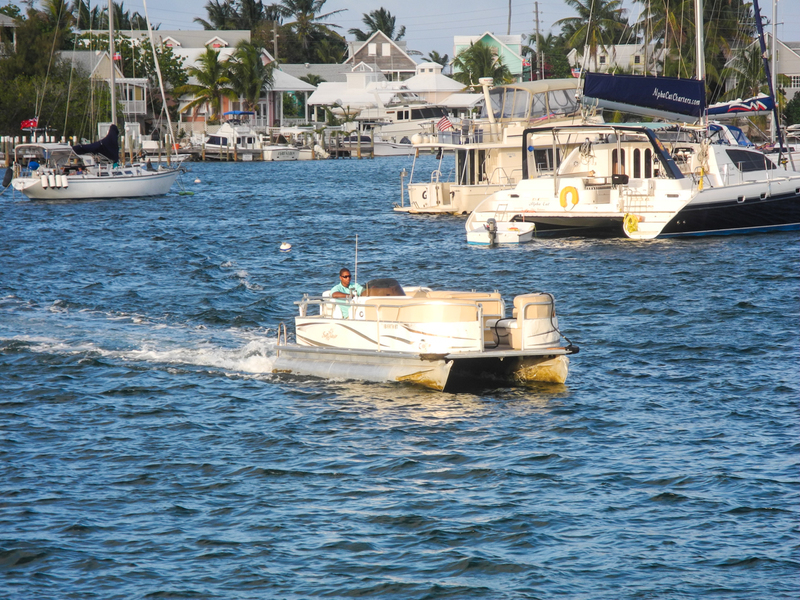 Located on the west side of the harbor it even provides a free boat shuttle to the small town on the east side. 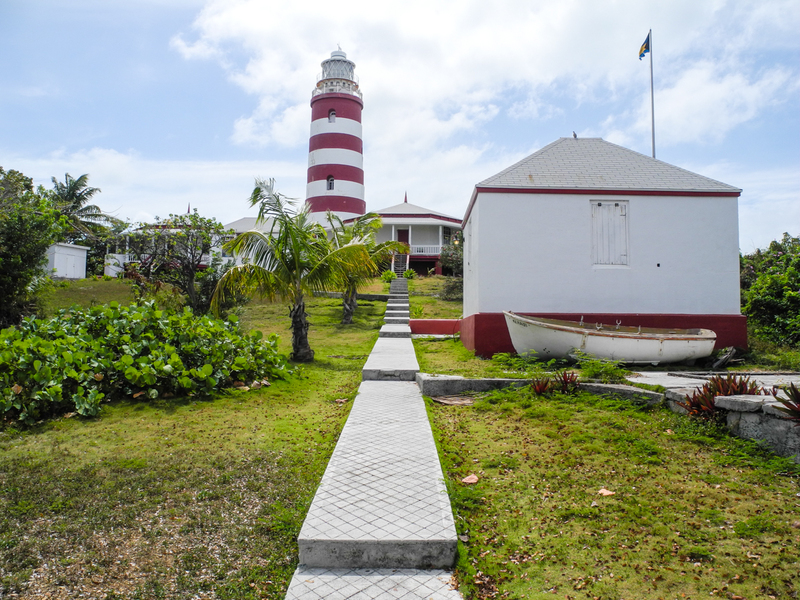 As we have written about in past years, Hope Town is incredibly picturesque with small pastel painted homes and cottages. It also boasts a lighthouse which you can climb. 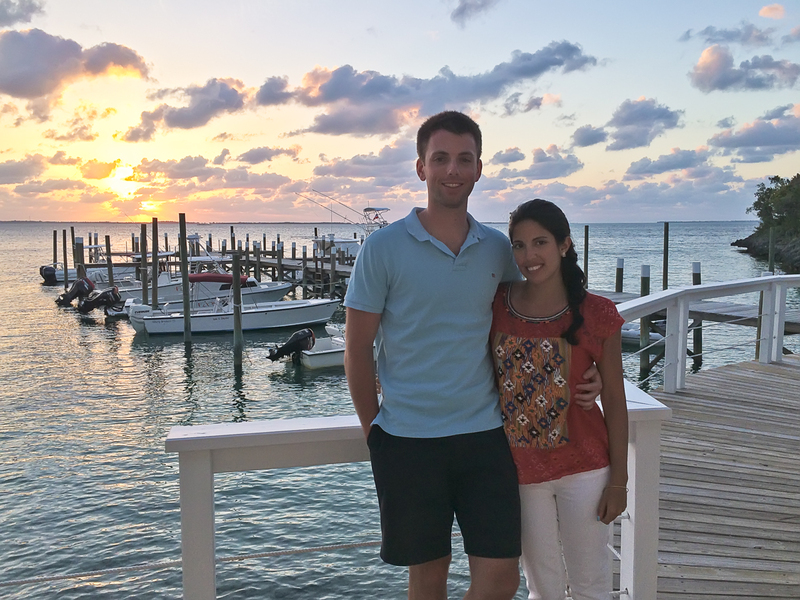 Andrew and Nicole arrived from Washington DC and took a cab to Mangoes Marina in the heart of Marsh Harbor. 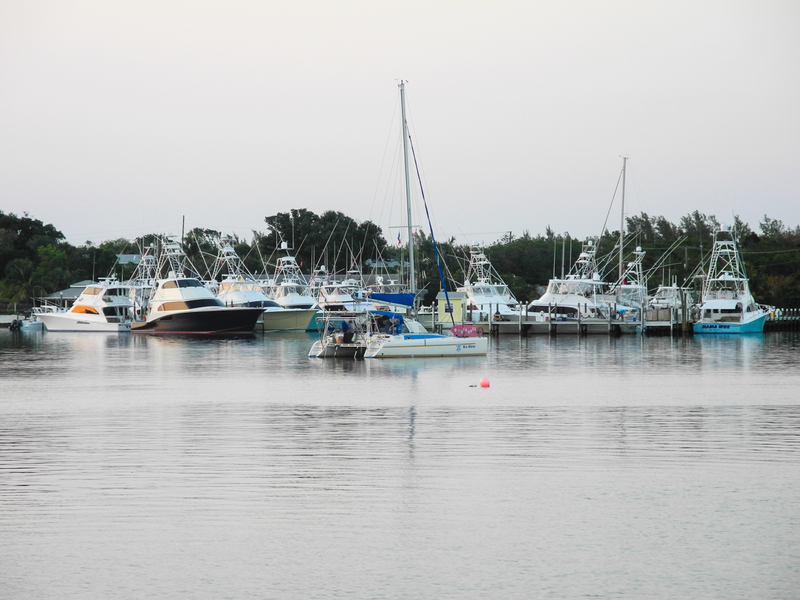 While Marsh Harbor is an oft used convenient stop for boaters it is not a place we would want to stay for long. You can stock up on food, booze and fuel and leave. It is, though, a very convenient stop to pick up guests. 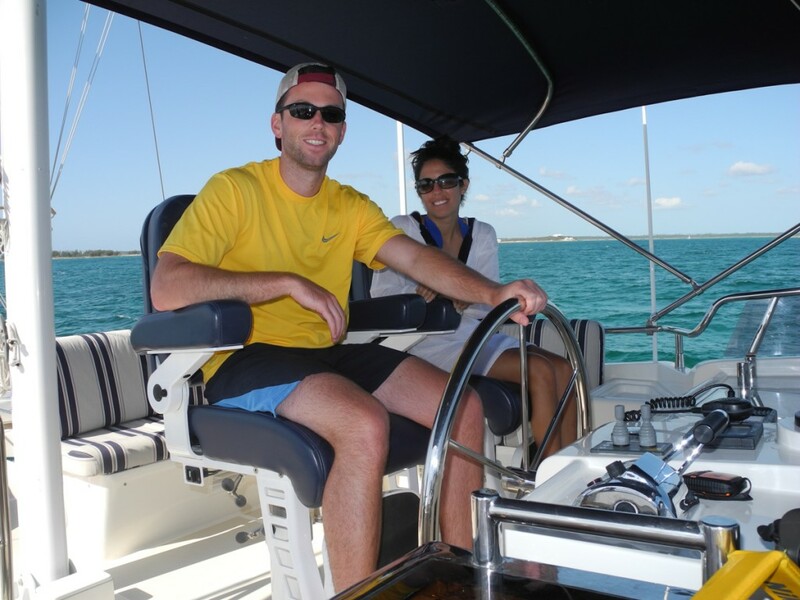 Neither had been to the Abacos so we decided to do some back-tracking including Hope Town and the Bight. Since we all love to eat, especially Andrew and Nicole we arranged for a favorite restaurant to pick us up at the Hope Town dock and transport us to dinner. The restaurant known as “Firefly” is superb. The outdoor dining during a beautiful sunset is hard to match. And the food is spectacular. Our agenda for the 6 days was loose. 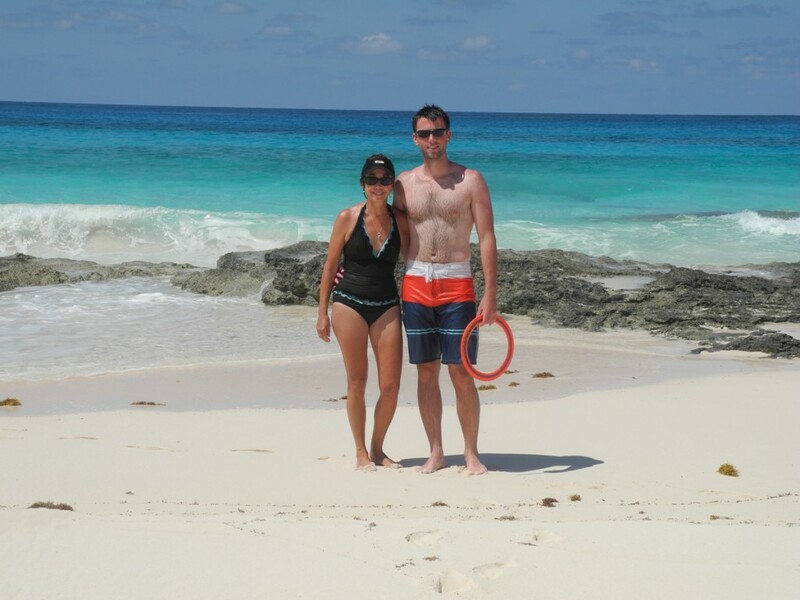 We made stops at Tahiti Beach, Man O War Cay and of course Great Guana Cay with the famous “Nippers” and magnificent beach. 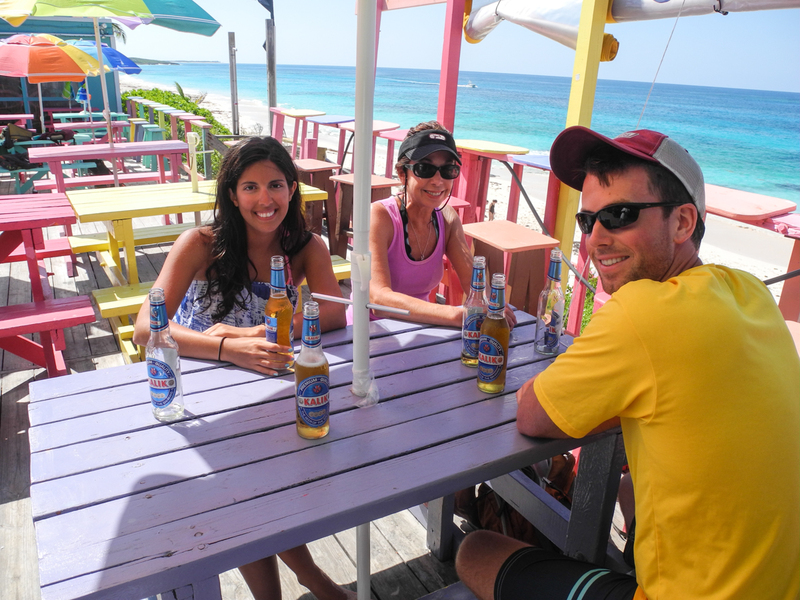 At Nippers we caught up with our friends who coincidently had a couple of their kids visiting for the week. The six days went real fast but the weather was perfect as was the company.